As we all work away on our PC’s, without a care in the world, the unfortunate truth is that quite a number of things could go horribly wrong at any minute! Our systems are at a low, but nonetheless constant, risk of suffering a catastrophic malware attack, disk failure or corruption of files & programs. Performing a backup of your system is, therefore, a crucial step in ensuring that you can recover your system should a tragedy occur. Thankfully, Windows 10 comes with built-in tools that allow users to back up their files or the entire Windows system including their personal data and restore it back to normal use. In this tutorial we are going to cover these tools and their usage, so you could sleep well at night and know that your data is safe. A system image is a snapshot of your entire system. It comprises of all your personal data, program files, program settings and Windows registry settings including your Windows 10 installation files. A system image file, therefore, ensures that your entire system is backed up and can easily be restored on a different drive. 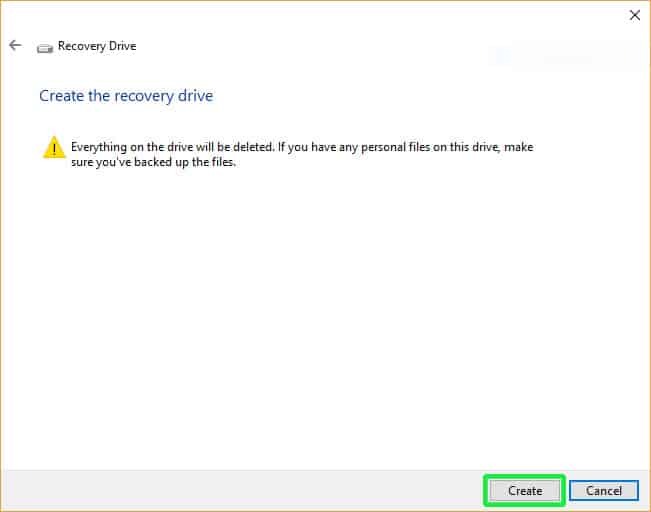 The greatest advantage of using this method is that since it backs up all files including the Windows installation files, you can replace your crashed hard drive and restore the system image on another drive without having to reinstall Windows and you’ll pick up from where you left off. This method requires a drive with a large volume to accommodate the system image. And the backup process is quite slow, which can demand a great deal of patience from you. First, we recommend that you connect an external hard drive with adequate space to your PC. The data will be backed up to that hard drive. 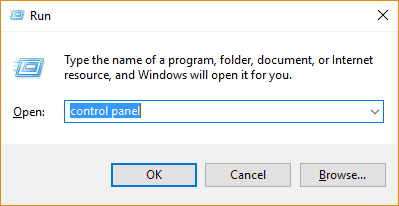 Open Control Panel by Pressing Windows Key + R, typing ‘control panel‘, and clicking OK. 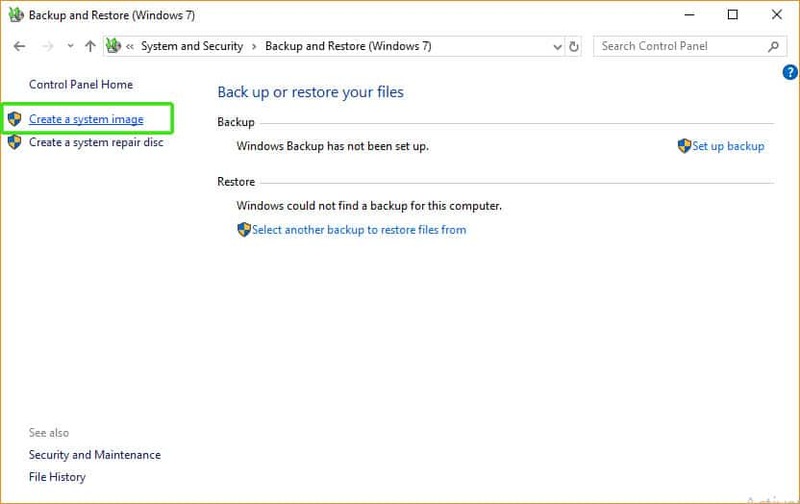 Under System and Security Click on ‘Backup and Restore (Windows 7)’ – yes, this is how this option is called even on Windows 10. 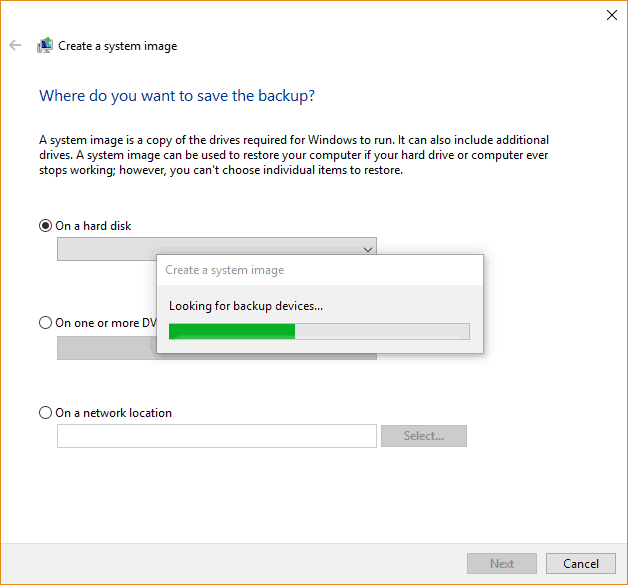 Windows will then begin searching for the backup location of the System Image. It’s always recommended that your backup location will be an external hard drive or a different computer on your network, so that it doesn’t get wiped out in the event of a disk failure. 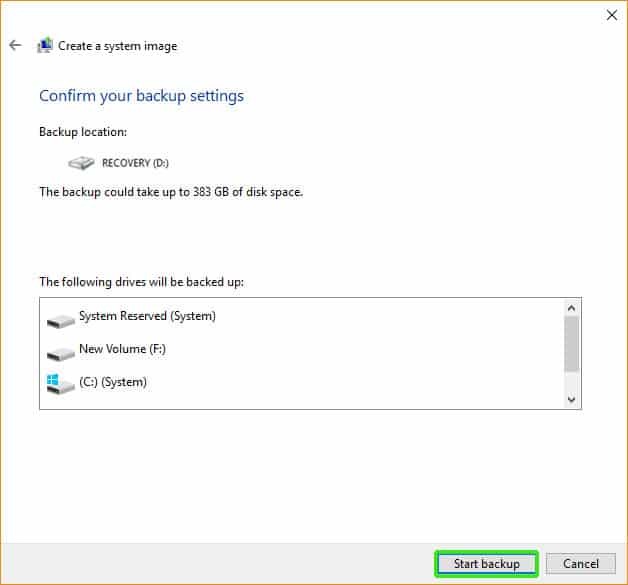 Three options are available for backing up your System Image file: An external hard drive, a DVD Drive, and a Network Location. 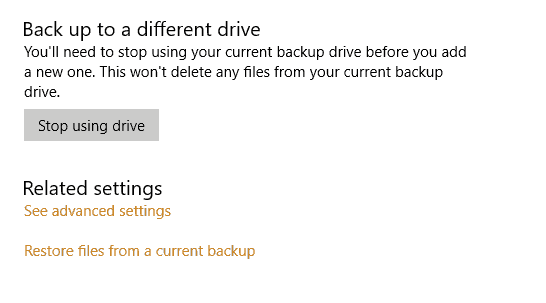 Next, Select the drives you wish to back up and click ‘Next’. 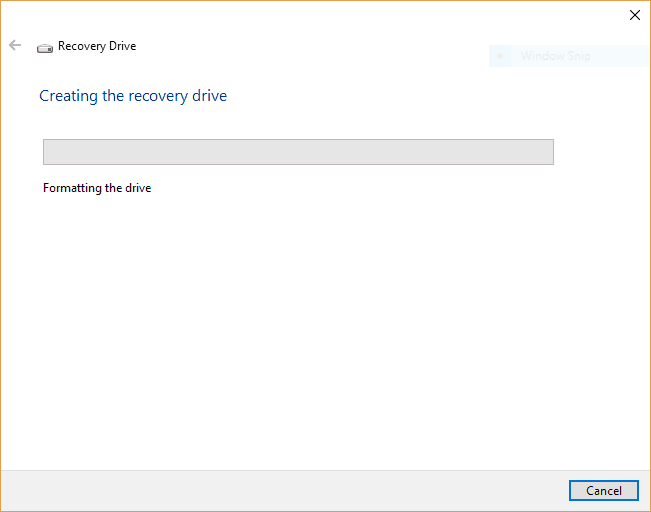 Note that the Windows Installation drive and System reserved drive will be selected by default. In the Next Window, Confirm the backup Location and Drives to be backed up. and hit ‘Next‘. 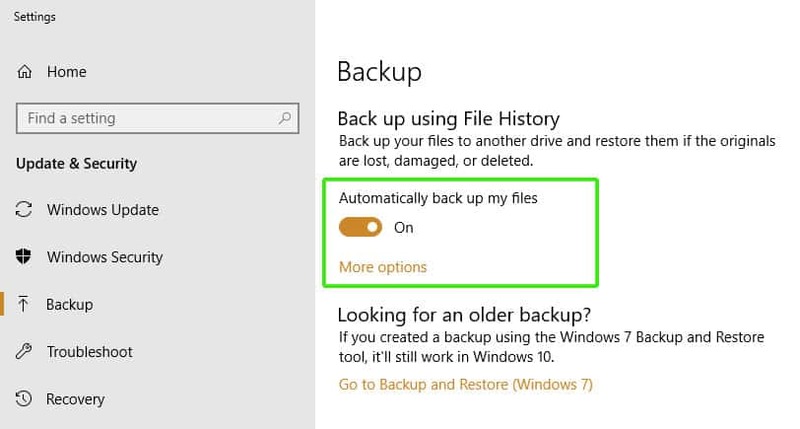 Once satisfied with your selection, hit ‘Start Backup‘. 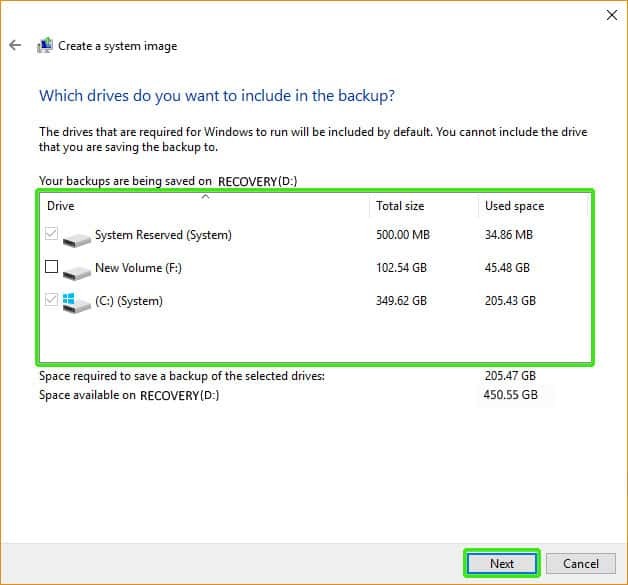 The system’s Wizard will start a full backup of all the drives you selected including the Windows Installation drive and System reserved partition. 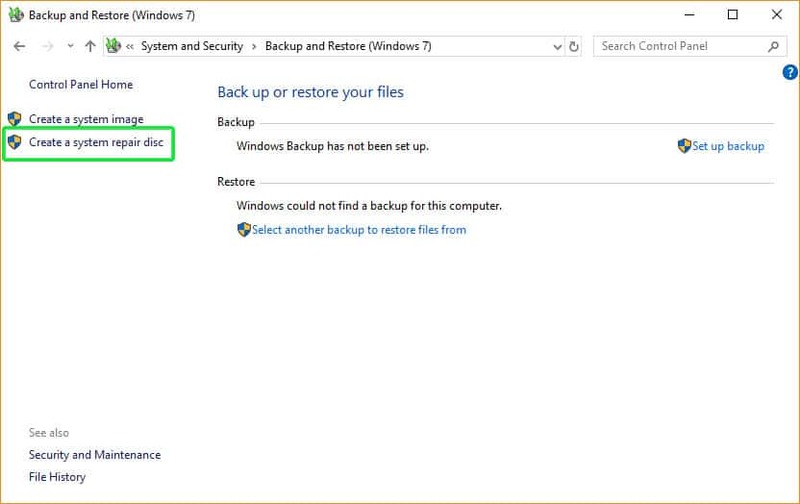 Windows will allow you to go ahead with your work normally as it creates a Shadow copy which is a feature that allows for the creation of backups while files are still being used by the system. 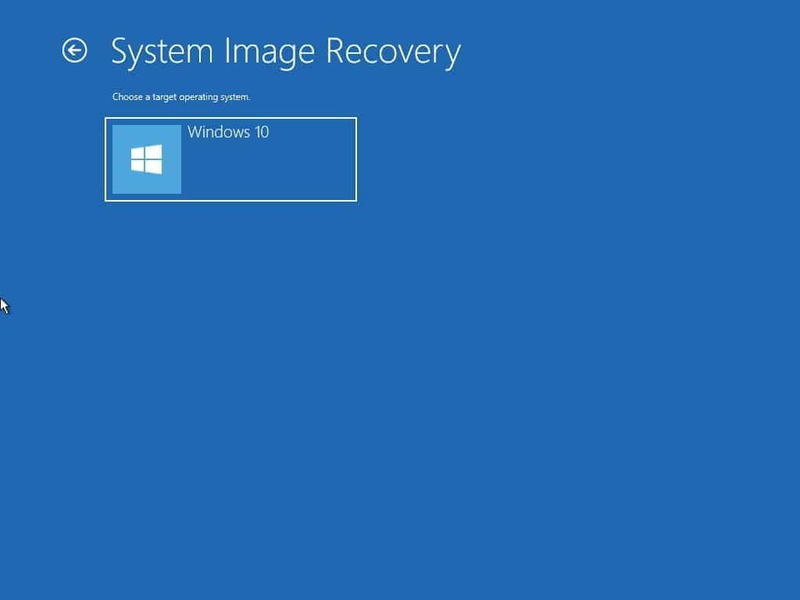 After the backup is done, you’ll be prompted to create a system repair disk to access the recovery options if your computer is unable to boot. 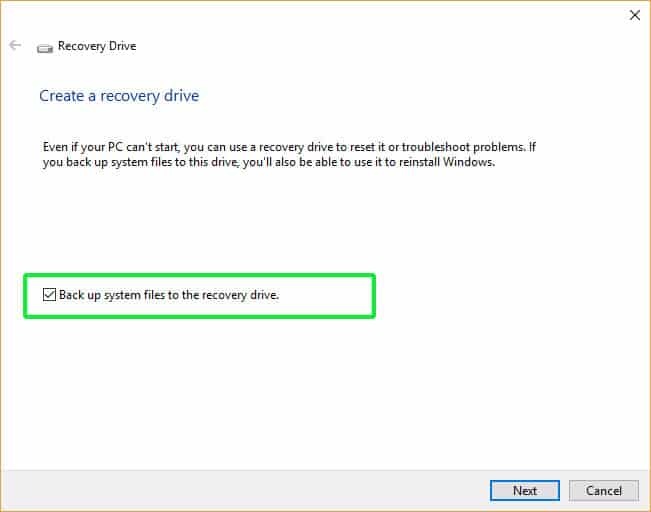 While this is not mandatory, it is highly recommended to create a System Repair disk or a USB recovery drive to help you recover your system. 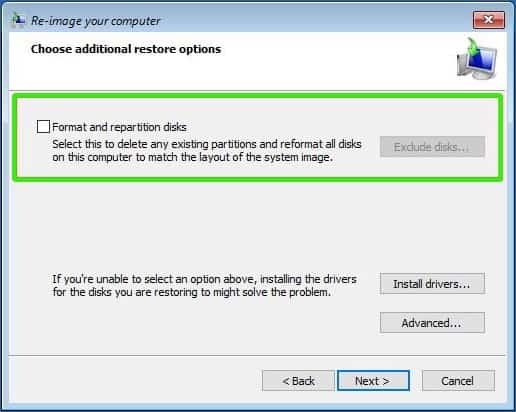 To create a System repair disk to recover your PC in case of a boot failure, follow the steps below. 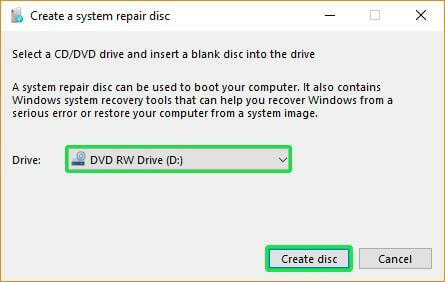 Next, select the DVD drive with a writable CD or DVD already inserted and thereafter click on ‘Create disc‘ to commence the creation of the system repair disk. This process only takes a few minutes as it does not involve backup of your system files. Upon completion, you’ll get a pop-up notification on how the System Repair disk is used. 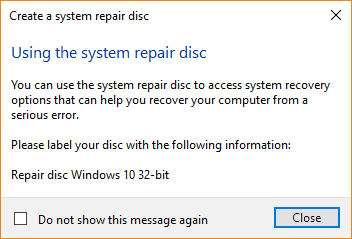 Please note that the System repair disk is tied to your Windows version. 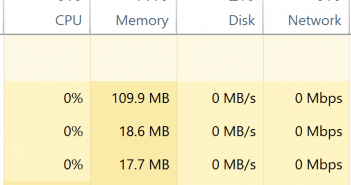 If you are running a 32-bit version, you cannot use a System Repair disk created by a 64-bit Windows 10 PC to troubleshoot it. Finally, Click on ‘Close’ then ‘OK‘. You can also create a recovery USB drive instead. Note: the USB drive will only be able to boot from the computer that you created it on. Be aware of this disadvantage compared to the recovery drive. 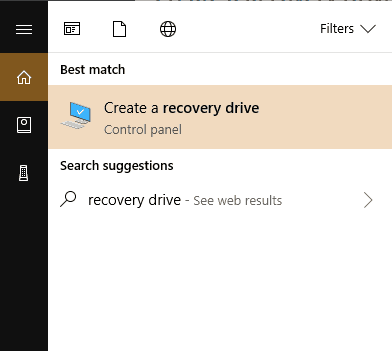 Type ‘Recovery Drive’ in the Cortana search field and click on the ‘Create a recovery drive‘ option in the menu that appears as shown. 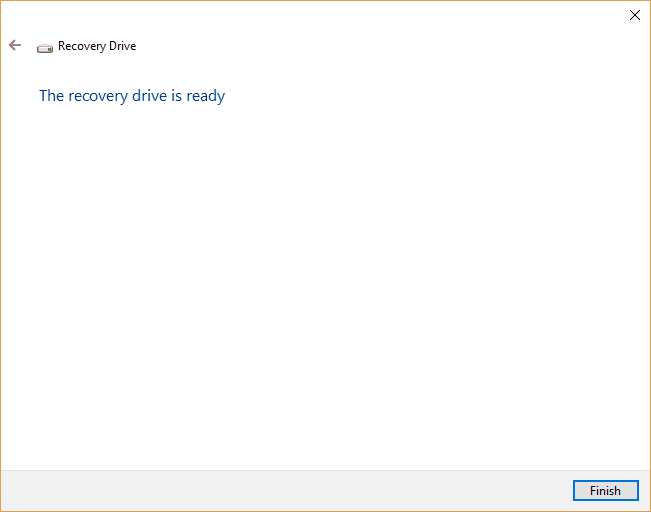 In the Recovery Drive Window, check off the ‘Back up System files to your recovery drive‘ option. 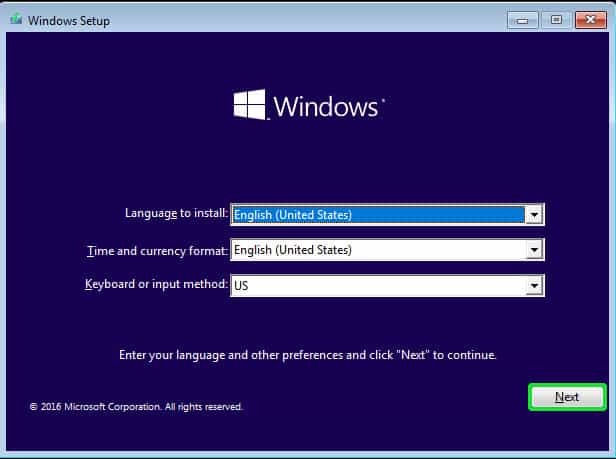 While this option may take longer to complete, it helps you reinstall Windows if needed. 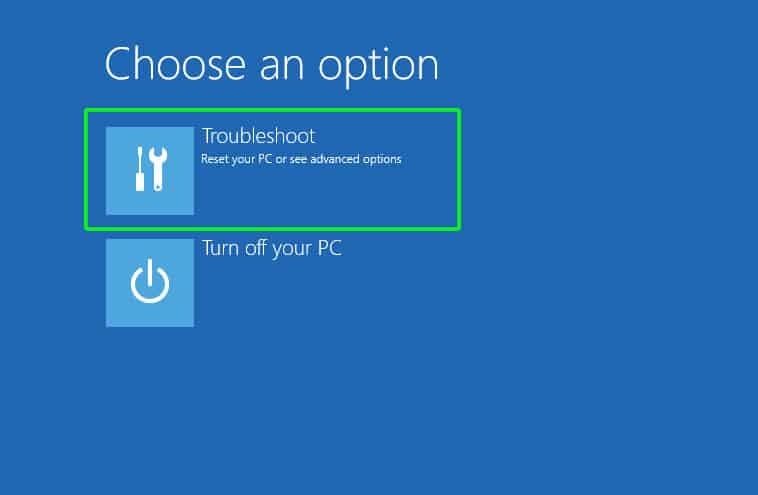 If you decide to leave it out, you’ll only have access to the troubleshooting options such as resetting your PC but will not be able to reinstall. 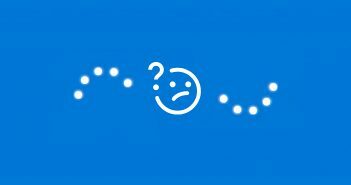 Once satisfied with your option, click on ‘Next’. 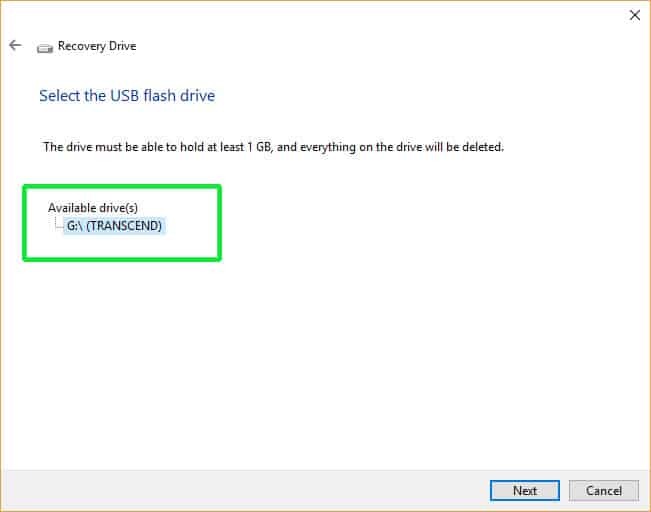 Next, select your preferred USB drive to be used as a recovery drive and click on ‘Next‘. Take note that the drive will be formatted first, so ensure you back up all the data in the drive to a different location. Click on ‘Create‘. Formatting of the selected drive will then begin, followed by copying of system utilities. 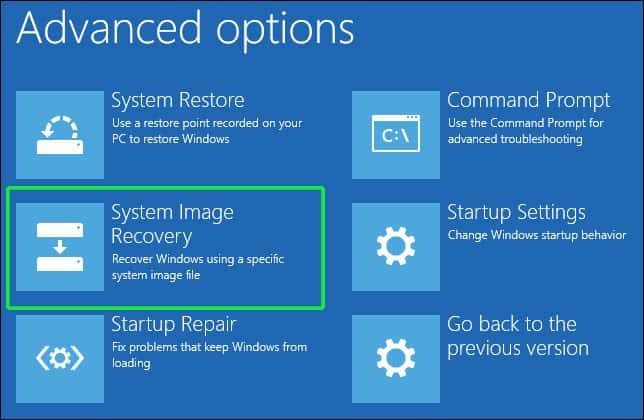 The System repair disk and USB recovery drive are used to troubleshoot a PC which cannot boot up normally and can also be used alongside a system Image to recover the PC in the state it was before failure. 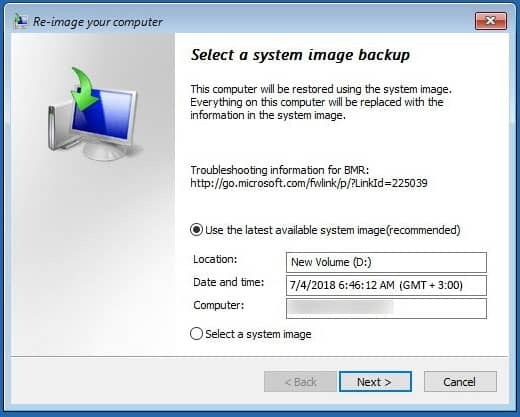 If you want to restore the system image that you’ve made at a previous time, you’ll need to use either a system repair disk / USB recovery drive alongside an external drive containing the System Image. Reboot your System with the repair disk / USB recovery disk plugged inside and make sure to enter the BIOS settings by holding either F10 or F9 (or in some vendors, the Escape Key). Adjust the BIOS Boot order and set either the USB Drive or DVD Drive as the first priority if you are using a System Repair disk. Save the Changes and proceed with the reboot process. On the “Windows Setup” Window, click on ‘Next’. Select the Target Operating System which is Windows 10 in our case. 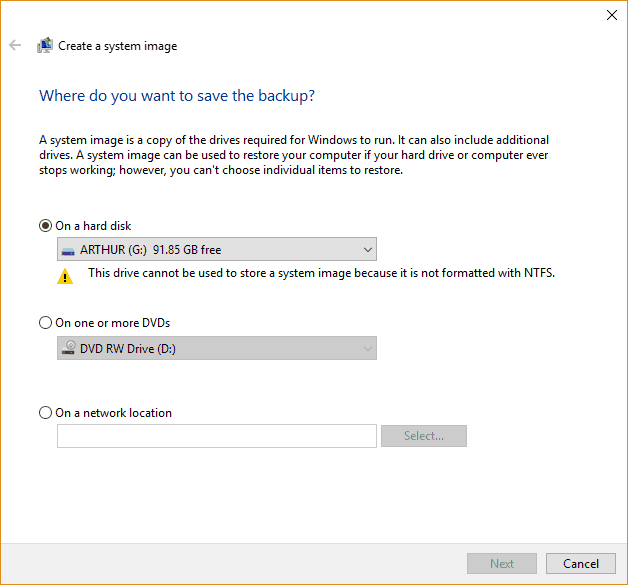 If you are restoring a full backup on a new drive check off the Format and repartition disks option. The restore process will commence thereafter and time is taken to fully restore your system will be dependent on the amount of data to be backed up. 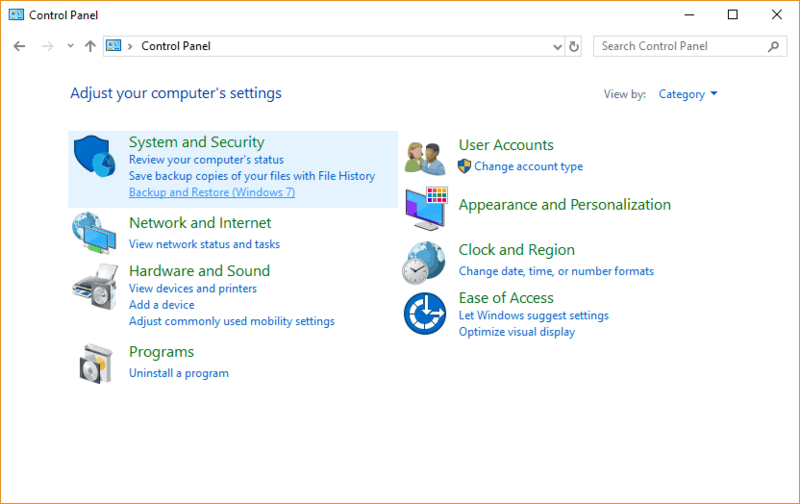 Windows File history is another built-in backup tool used to restore previous versions of document files in your system. It creates a library of previous versions of your documents over time that you can choose to recover from. If, for instance, you had deleted a paragraph from your document a while back and you are at a loss on how to recover it, file history can help you recover an earlier version of the document and let you access the version containing the paragraph. This will open the Windows Settings Page. 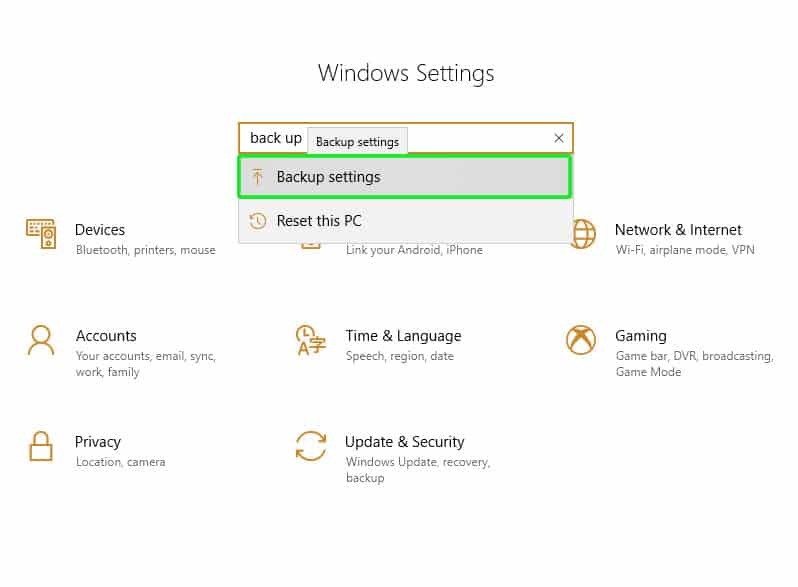 In the Search Bar type “Backup Settings” and click on the option from the pull-down menu that appears. 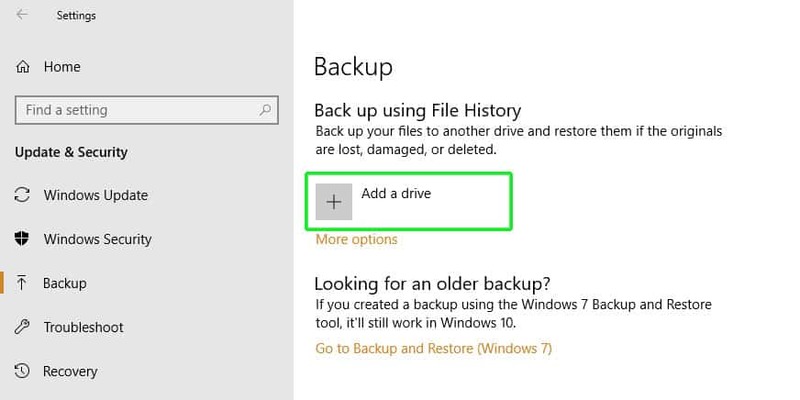 Click on the ‘+’ sign adjacent to ‘Add a Drive’ This will enable you to add the external drive as a backup location. Click on “More Options”. 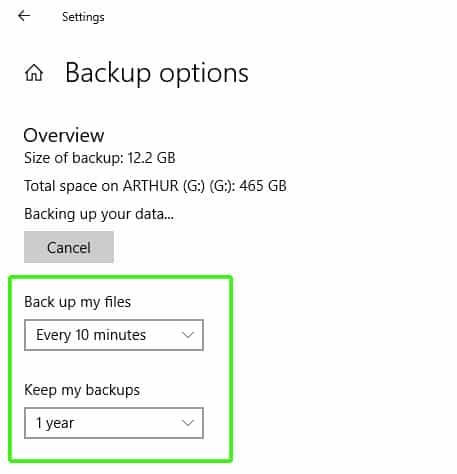 The next window will help you configure the frequency of the backups, the duration it keeps the backup copies as well as giving you’re the option of choosing which folders to back up and which to exclude. By default, File History automatically backs up your files every 1 hour, however, you are at liberty to select different times e.g. Every 10 minutes, 15 minutes and so on. 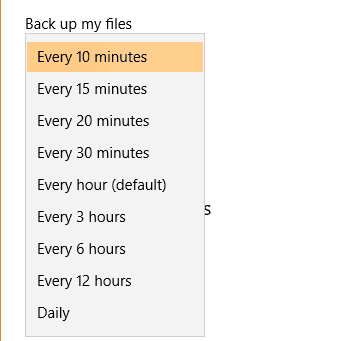 You can also determine how long File History tool will keep your backups e.g. 1 month, 3 months, 6 months and so on. 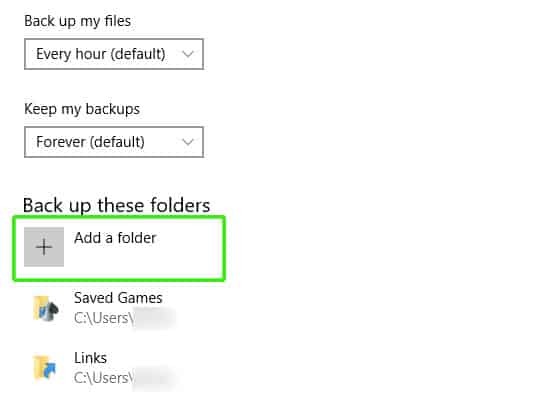 Folders in the users Account Home folder are set to be backed up by default and these include Desktop, Favorites, Pictures, Documents and Music to mention a few. To add a folder, click on the + sign as shown below and navigate to your preferred folder. 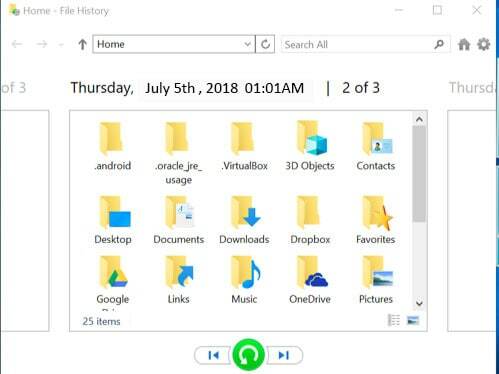 The next Window will take you to a folder called FileHistory. This gives you a sneak peek of your backups and enables you to browse through the files and select the files and folders you wish to restore. To restore a file or a folder, click on it and click on the green button. Another handy and secure way of backing up your vital personal data is transferring them or synching them to the cloud. There are quite a number of Cloud services available – most offering free storage capacity up to a certain limit and charge a low monthly fee when the limit is exceeded. Most of these services offer between 2 GB to 15 GB of free cloud storage. Some of the popular Free cloud storage services include Google Drive and Dropbox. Microsoft has its own built-in Cloud service called OneDrive that comes with an Office subscription. A full subscription of Microsoft Office 365 gives you a whole Terabyte of OneDrive space: plenty of space to save all your files. 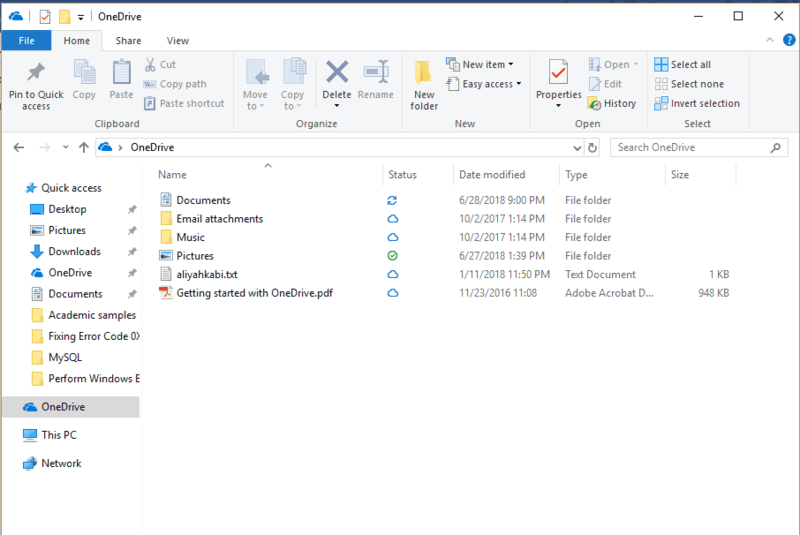 Upon signing up for these Cloud services, one is prompted to create a special Upload folder on the PC just like the OneDrive Folder that already exists in Windows 10. Any files placed in the upload folder are automatically uploaded and synced to your online cloud storage and made accessible from any device that is logged in to your account. 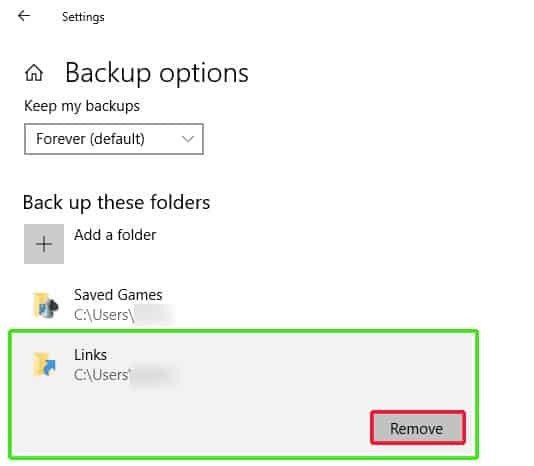 To back up and synchronize your files, you’ll have to move all your crucial files and folders to your OneDrive folder and give it some time for the synchronization to take place. An ideal back up system is one that combines both onsite and offsite storage. A combination of both file and cloud backups is recommended so that in case the hard drive fails, one can always login into their online account and retrieve their precious data. It is mainly suggesting a method by following that users are able to take a backup of all the required data in their own way. Keeping a back up is always fruitful for every user to stay in a safe side. It will definitely useful for the users. My one of friend didn’t take the back up on Windows 10 but after followed your steps we resolved this issue easily. Thanks for sharing.